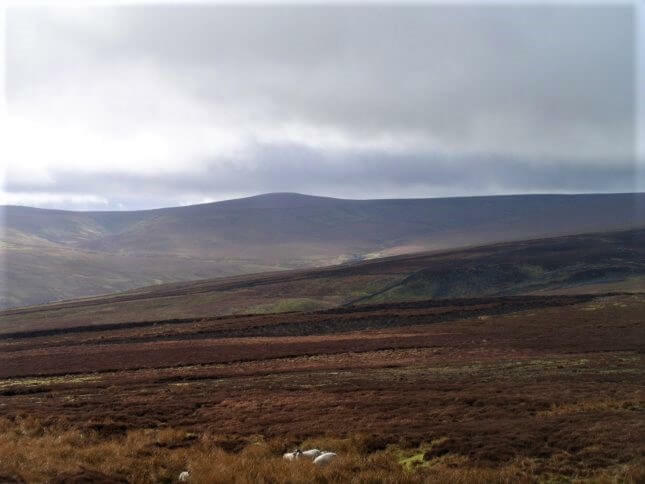 Meugher is the highest point of the vast sweep of moorland to the south of Great Whernside and is possibly one of the more remote summits in the Dales. According to Meugher’s listing on Wikipedia the name (pronounced mu’fer) was first recorded as Magare in 1120, and probably derives from the Old Norse mjór haugr, meaning “small hill.” The name is apt as Meugher is a prominent little bump overlooking a vast swathe of moorland which stretches for miles to the south and east. 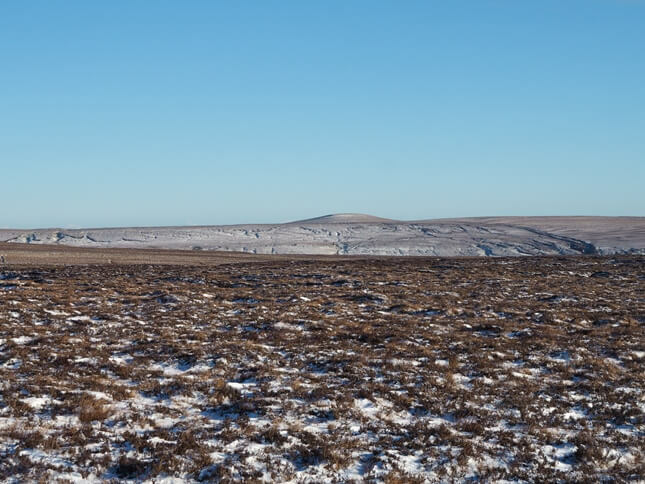 To the north the moor gradually rises to reach the much higher ground of Great Whernside. Meugher is situated less than a mile outside of the boundary of the Yorkshire Dales National Park. It is instead situated in the Nidderdale Area of Outstanding Natural Beauty. Although there is higher ground within the AONB it is the highest summit that is completely within the AONB’s boundary. It is fair to say that Meugher is one of the remotest summits in the Dales. 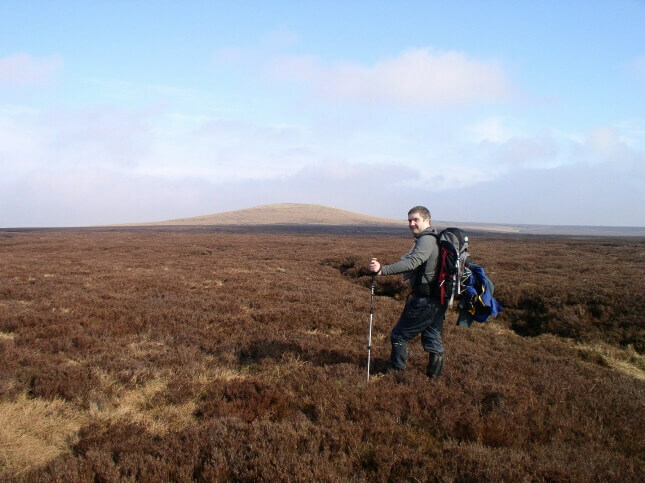 Whether approaching from Wharfedale to the west or Nidderdale to the easty it is several miles to the summit. There is no public footpath to the summit though one does pass two-thirds of a mile to the north of the summit. It was via this path that I had my first visit to Meugher back in 2005. On that occasion my friend (another Matt) and I had planned a walk to the trig point on Conistone Moor above Wharfedale. It was a nice day and we felt like going a bit further. Having got as far as Mossdale we looked at our maps and saw that another couple of miles would bring us to Meugher. So it was that we decided to carry on. Leaving the faint right of way we then battled through heather and hidden drainage ditches to gain the summit. Somewhat remarkably whilst we were there an oldish looking rambler appeared. Seeing another walker on Meugher is a very rare occurence. 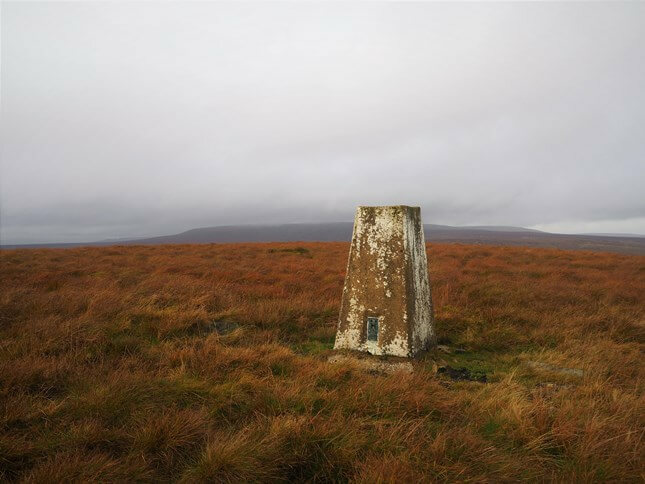 The summit is topped by an Ordnance Survey trig point which was built in 1950. At the time of our first visit it was the only significant feature other than the sweeping long distance views. Matt in particular was very impressed with the feeling of remoteness and not long after went back and wild camped there. It was eight years before I returned and when I did so I decided to have a go at finding a route from Nidderdale. For my route of ascent I utilised a shooters track that can be gained near Moor House to the north of Blayshaw Gill. This track leads for approximately three and a quarter miles until it crosses Meugher Dike just below the ‘bump’ of Meugher. After visiting the summit I then descended north to the Mossdale to Stean path and turned east for a long walk back down into Nidderdale. This proved to be a good viable circular walk and the shooters track is by far the easiest approach. I used it again on my third visit in 2018. 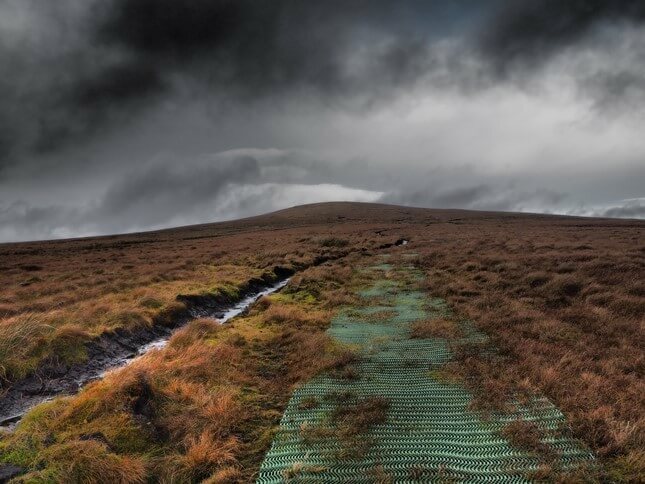 On this occasion some green matting had been laid on the slopes above Meugher Dike which enabled me to get within a couple of hundred metres of the trig point before I had to tackle the pathless ground. 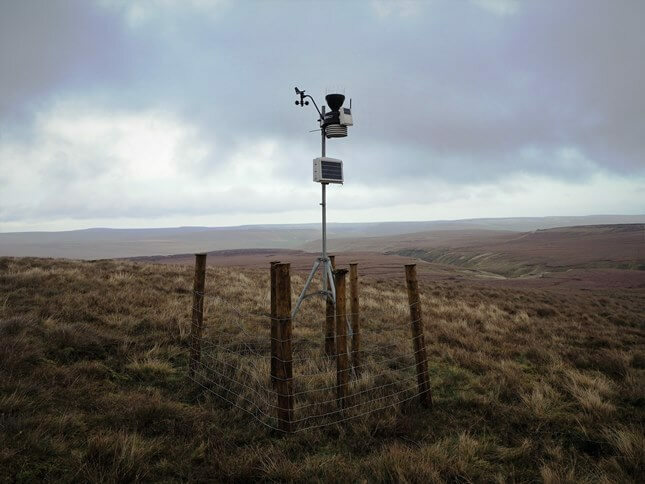 It was on this visit that I came across the small weather station, situated to the south of the trig point. It wasn’t there in 2013 so is a recent addition to Meugher’s summit. 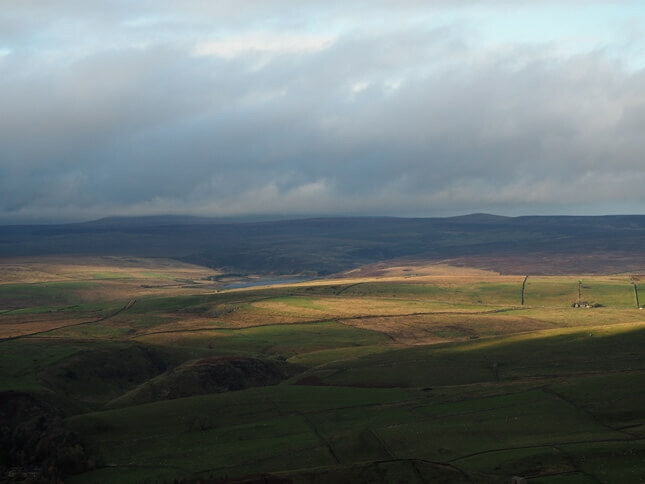 As noted above the view is largely dominated to the north by the growing bulk of Great Whernside and to the east are the high moors above Nidderdale. The best view is to the south and south-west and includes Simon’s Seat, Cracoe Fell and Flasby Fell. On a clear day the views extend further to the likes of Pinhaw Beacon, Weets Hill and even Pendle Hill. It is actually quite interesting to try and spot Meugher from these distant fells. 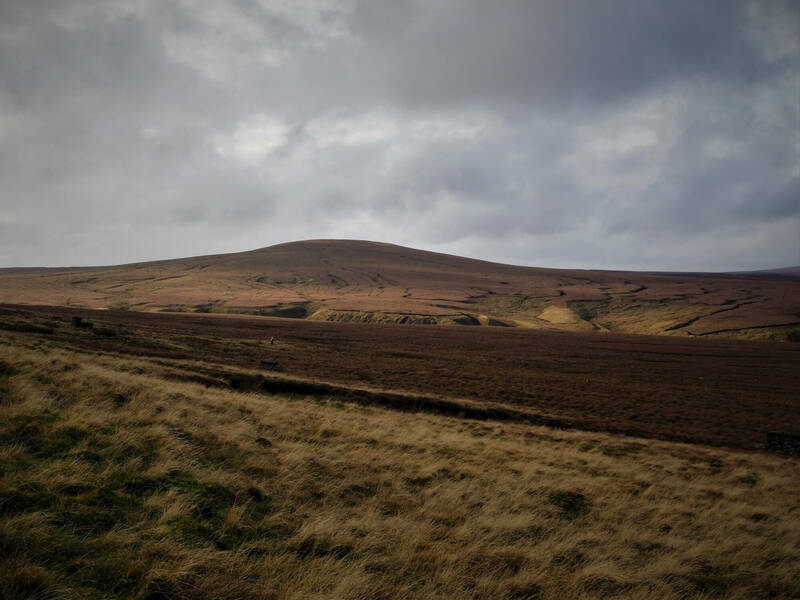 As long as Great Whernside is not directly behind it then Meugher can often be spotted as a tiny little bump on the skyline. Meugher will never be a popular fell. Instead its delights will only be appreciated by connoisseur’s of solitude and wide empty spaces.